New Orleans has dozens of parades during Carnival season, culminating in the biggest day of celebration today for Mardi Gras, or Fat Tuesday. Most of these parades are staged by traditional social organizations, also known as "Krewes. " Here are just a few of the many Mardi Gras parades in New Orleans, in chronological order. The Krewe du Vieux was founded in 1987 as a combination of various sub-krewes that had split from the Krewe of the Clones. The history of this parade is worth a detour to read. ...the Krewe grew from about 150 drunks stumbling through the French Quarter in search of a bar, to become a relatively well-organized group of about 600 (most of them still drunk), with an actual parade route. 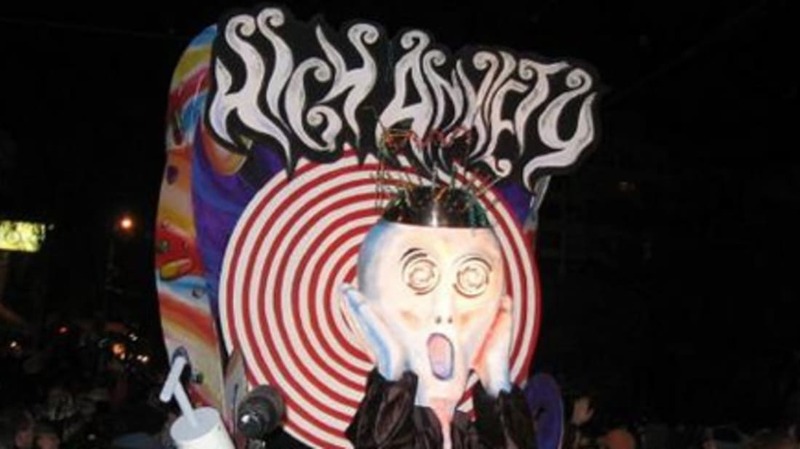 The Krew du Vieux parade was held February 3rd with the theme "Habitat for Insanity. " Watch a video of this year's parade. The Krewe of Barkus is limited to dogs, and their parade February 11th is the only parade dogs can participate in. Proceeds from the parade and the ball afterwards go to animal charities. Watch a video of this year's Barkus parade. The Krewe of Endymion parade is held the Saturday before Mardi Gras. Endymion is a relatively new krewe, staging its first parade in 1967. This parade is known for contemporary music, huge floats, elaborate costumes, and a king and queen selected by a drawing! The Krewe of Bacchus was founded in 1968 with the express purpose of revitalizing Carnival in New Orleans. Bacchus membership is open to anyone, including tourists! The parade was Sunday, featuring James Gandolfini as King Bacchus the XXXIX. See a portion of the Endymion and Bacchius parades from 2006 on video. The Krewe of Proteus was organized in 1882, and is now the oldest parading krewe in New Orleans. When segregated krewes were ordered to stop participating in parades, Proteus dropped out, but returned to parading in 2000. Their parade was last night, on Lundi Gras (Fat Monday). The Krewe of Orpheus was founded in 1993 by Harry Connick Jr., his father, Harry Connick, Sr., and Sonny Borey. The music-themed parade parade was last night, with Patricia Clarkson as the celebrity monarch. The Zulu Aid and Social Pleasure Club first participated in a parade in 1901, but didn't take the Zulu name til 1909. They still wear their traditional (and controversial) blackface and grass skirts, and pass out coveted Golden Coconuts to the crowds. The Zulu parade is the first big parade in New Orleans on Fat Tuesday morning. Watch a video of the 2006 Zulu Parade. Rex is the king of the carnival! The Rex Parade (New Orleans largest) has been part of Mardi Gras since 1872, and takes place on Tuesday morning. The Rex (king) is a prominent citizen selected a year in advance, but he must keep his identity secret until the day before the parade. The mayor of New Orleans traditionally hands the key to the city over to Rex for Mardi Gras. See more parade photographs here. Many of the fantastic parade floats are manufacured at Blaine Kern's Mardi Gras World. Enjoy your Fat Tuesday!